The SA-NT border crossing is more than just a line drawn in the sand. The site includes a free campground, barbecues and picnic tables, toilets, and an information bay. 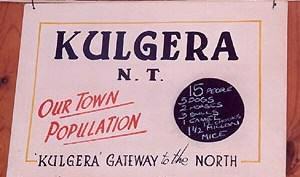 And a mere 21 kilometres (13 miles) north of the border is Kulgera, the Northern Territory’s southernmost town. It was early in the afternoon as we made our way towards the Kulgera Roadhouse for our first night in the Northern Territory. We checked into the Kulgera Roadhouse Caravan Park ([star][star][star][star_half]) and were pleasantly surprised by what we found. 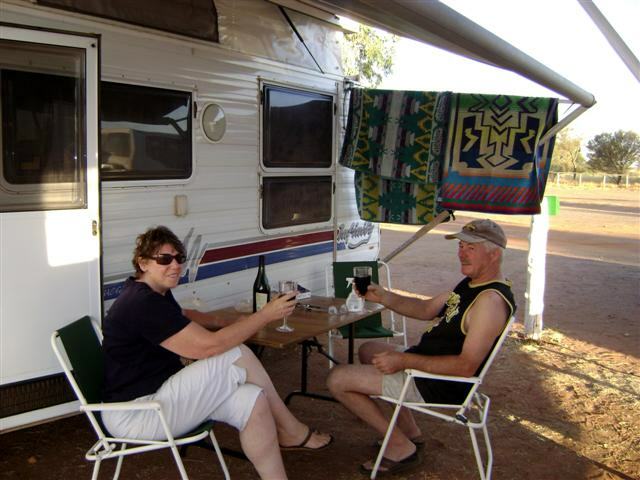 This is a real outback caravan park, red dirt by the acre and plenty of wide open spaces but it is far superior to some others we’ve seen. There are cabins and motel rooms as well as the powered sites, the amenities are very clean and there are a few patches of green grass here and there. And there is even a pool. We made good use of said pool in the heat of the afternoon. Dived right in and discovered that it is the coldest water this side of the Antarctic! I had never been in water so cold – been in hot water a few times in my life but this was definitely the coldest! How do they do that? In the outback where summer temperatures often top 50°C (122°F) they have a pool that has freezing water! Amazing! Refreshed, if not quite frozen to the bone, after our swim we decided to do a little exploring, not that there was much to see. 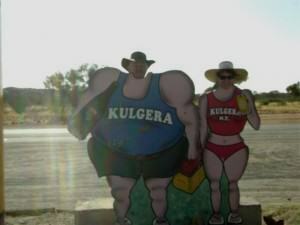 Kulgera is a small bush town surrounded by literally thousands of kilometres of cattle station. Although gazetted a town, it really is no more than a stopover along the Stuart Highway. Established as a sheep farm in the 1920’s, it was converted to cattle in the 1960’s. In 1955 a store was built on the site and over the last 50 years that store has evolved and expanded into the Roadhouse it is today. This whole area is Pitjantjatjara Country and Aboriginal rock paintings can be found throughout the region. The only buildings in the town are the roadhouse and the police station but a few kilometres away is the Pioneer Museum, housed in a 1920’s outback homestead, and the Johnston Geodetic Station. 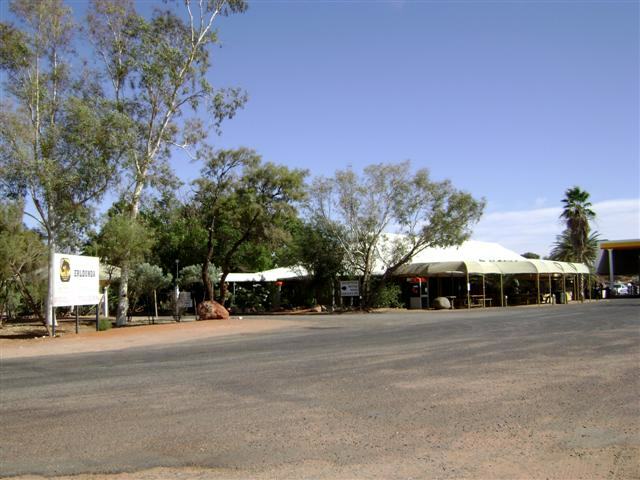 Kulgera Roadhouse has actually been pinpointed as the geographical centre of Australia. Having seen almost all there was to see in Kulgera we returned to camp and went for a walk around the park before settling down with our bottle of Two Tails Sparkling Wine to toast not only our first night in a new caravan park but our first night in the Northern Territory and the start of a new adventure. Kulgera is a great stopover point for travellers in the long journey from the bottom end to the Top End in Australia, a welcome oasis in that sea of red dirt. And I still don’t know how they keep that pool water so cold!